'Psi-Ops: The Mindgate Conspiracy' is a sci-fi third-person shooter game developed by Midway Games and released for the Windows PC, Xbox and PlayStation 2 in 2004. The game was released as a free download in 2008 which was ad-supported meaning players see in-game advertising during gameplay. There was an option to purchase the ad-free retail version. 'Psi-Ops: The Mindgate Conspiracy' tells the story of Nick Scryer. Nick is a man whose memory has been erased to prepare him to go undercover inside a terrorist organization that is known as The Movement. Players will control Nick as he tries to move his way up in The Movement to gather more information on psi based powers and objects that have been the cause of many wars over the past century. Remote Viewing: Gives players vision through objects and walls while their body remains frozen. Mind Drain: Drains an enemy's mental energy allowing players to replenish their own. Mind Control: Allows Nick to take control of another person's mind and body. Pyrokinesis: Allows players to generate a flame with the movement of their arm. Aura View: Gives players the ability to see beyond the visible spectrum and seeing in other dimensions. Telekinesis: Gives players the ability to move objects with their mind. In addition to these psychic abilities, players will also use traditional weapons and firearms as they battle their way through an army of terrorists. 'Psi-Ops: The Mindgate Conspiracy' features both a single player storyline and co-operative multiplayer which gives players the ability to play through single player with another player. 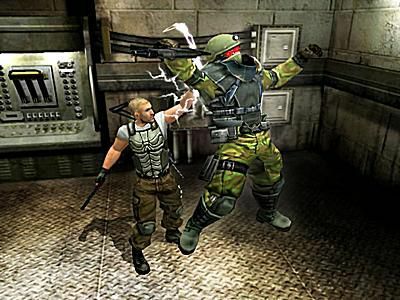 The game was developed with the Havok 2.0 game physics engine which allows for the realistic animation and gameplay of many of the psychic abilities used in the game. The ad-supported version of 'Psi-Ops: The Mindgate Conspiracy' was first available exclusively on File Planet, but now that File Planet is no more it is a little more challenging to find a legitimate download of the game. Developer Midway Games filed for bankruptcy shortly after the game was released and was then acquired by Warner Bros which appears to have abandoned the game. Some third party websites offer the ad-supported version of the game for free download as well as the ad-free version. Download links to those sites can be found below.